Ever struggled with a decision? Dealing with one now? Ever made what you thought was a poor decision that turned out well? Ever made a good one that turned out poorly? I’m sure you don’t need my repetitive babble as you have better things to do today, like spending time deciding or maybe spending over ten hours of your life today interacting with a device! Yep, these ten hours on your iPad, iPhone or computer etc. are decisions made on how you choose to spend your time whether wisely or aimlessly. Making decisions is the easy part of the decision process and as a result, you would think most people would be able to handle this first step in life’s decision process. 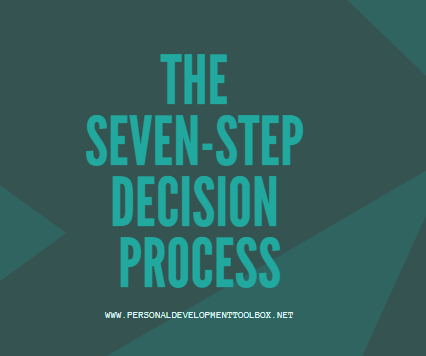 So, what are the seven steps to an effective and successful decision process? -Consider the process: desired outcomes or results, potential risks and/or rewards, time-frames, available resources, courage, passion, desire or fears associated with it, previous similar decisions and outcomes. Get it? You just don’t make it without a little pre-thought. -Decide; this is the easy part – say yes or no – maybe is not a decision, not now is not a decision, when things get better or change is not a decision, I hope it will all work out is not a decision, someday I will is not a decision, if my inaction doesn’t work I’ll do something is not a decision. -Plan; planning is taking all the details, facts, lessons, considerations, resources and deciding on the best, the ideal, the only etc. approach. Here is where you map out and blend the various steps in the process execution; the expected outcomes, the benchmarks, the guidelines, the rules, how you will handle potential roadblocks, hazards and/or setbacks, mistakes or failures, how to manage resources of time, money, people and any other certain or uncertain resources. -Act; now it’s time to get moving executing the plan developed. You begin. You get started; no waiting, no delaying, no excuses, no fears, no hesitation – just get moving. -Monitor; this is the time for discipline, observation, awareness and record keeping. Without these actions how will you know what works, what doesn’t, what might have or what needs to be trashed? This is also a time for monitoring the path to success. If you didn’t set a timeframe or time or complete time/date you will tend to get distracted, sidetracked and even lose passion, attention or the desire to keep going. -Evaluate; Now it’s time for review – what worked, what didn’t, what took too long, what cost too much, what took too much time or used too many resources. What needs to change? If it is changed how will we know we will get better or different results the next time? Is the entire project, program – whatever – worth it? Will it pay off adequately with additional time, resources, people or patience? Don’t skip this step or if something fails – you will tend to fail again if it is tried again in the future. If it took too long or too many resources how do, we or can we still accomplish it with less or fewer resources? Important questions if you want a better track record of success and less failure, disappointment in the future. -Act again; Simple – take the learning from each step above and blend it into your re-try. But, follow the same steps above or again, if it fails you may never know why and could set yourself up for repeat future failures.